Prudential Corporation Asia is currently growing its financial and insurance business at an impressive rate in Asia. An active and structured management system of their talent is therefore not an option, but essential to ensure they stay competitive. One of the most significant challenges is succession planning for the executive roles throughout their operations in 13+ countries in Asia. The current level of internal recruitment to such roles has to be increased considerably. To enable this PCA needs to be able to rely on a substantial talent pipeline at all times. As PCA had already identified a large number of High Potential talents across Asia, they needed a firm understanding of each individual’s readiness for progressing into more senior roles, based on common benchmarks. In addition, Individual Development Plans for the longer term perspective needed to be continuously improved and revised. Due to these challenges, Prudential intended to install a robust process for identifying and developing their talents on different levels in Asia. The concept was to design an integrated approach across the business, called “Insights on Talents”. The involvement of the senior leadership on the regional and local levels was critical to accomplishing the goals. An initial and significant step was therefore interviewing Senior Executives from the different countries, which provided valuable information on common challenges and critical success factors throughout the company. The information obtained during these interviews came to form the foundation for the content of the challenges used in the programs. A second step was to help the local talent management and senior leadership team better understand the structure and content of the integrated process and how it related to existing development programs. To achieve this aim, PCA and FLI designed briefing materials together. Finally, to ensure total ownership of the process, PCA wanted to engage their own successful talent and line managers as facilitators and coaches in the different programs. Hence, PCA searched for a partner who could design programs, support in piloting them and then transfer the complete IP to PCA. Together with Prudential, FLI outlined a process that targeted three different talent groups. For each target group, FLI then developed a program consisting of an assessment piece as well as a development piece. For the High Performing Employees, the focus on assessing leadership behaviour was high, while for the Senior Executive Group, the focus was on increasing the participants self-awareness and understanding of what is required of them in the future. 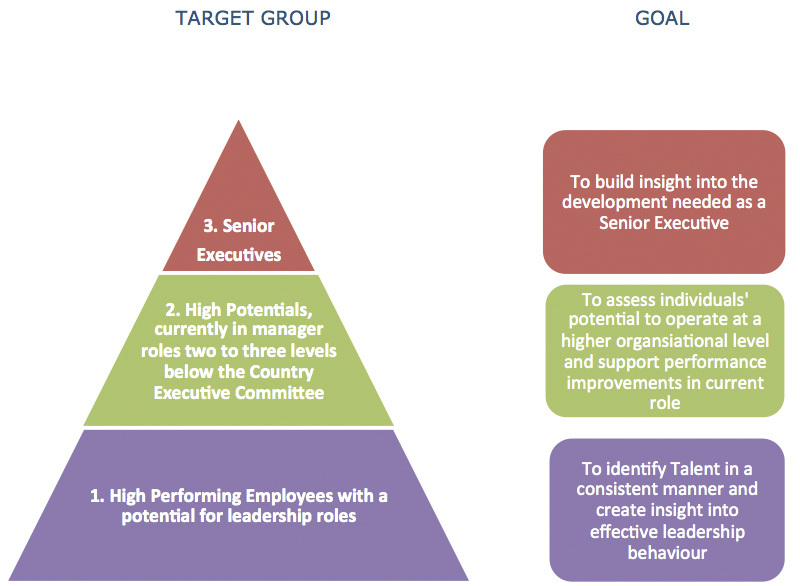 For the High Potential group, equal emphasis was placed on the assessment of leadership capability and the scope for individual development. Finance & insurance industry-relevant assessment simulations at each of the three levels. Leading the Business into the Future – A high level simulation on outlining and presenting strategic business scenarios. A Press Interview – A role play on communicating with high impact. Change and Grow Together – A group challenge on merging two organisations. Design an easy to use administration manual and ‘toolkit’ to support the preparation, conduction and follow up of each of the programs. Pilot the programs along with PCA staff and Senior Executives. Fine-tune the programs based on the evaluation of the pilot. Oversee the role out of the program across Asia during the initial phase. Ensure consistency and accuracy in determining potential across a vast number of staff. Make the content industry relevant and adapted to the needs of very diverse cultures. Avoid premature progression of staff who are not yet ready and/or motivated to progress into more senior roles, while maintaining their self-esteem and increasing their aspirations to develop and grow. Promote the accelerated development of truly talented and motivated people. Establishing independency of external consultants in the delivery of the programs by training internal Talent and Line Managers to facilitate the programs.